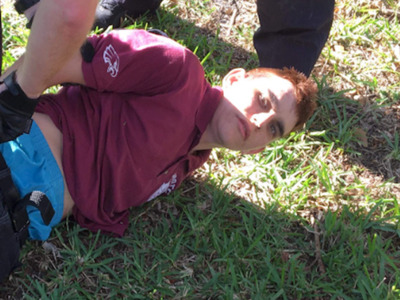 Florida shooting suspect Nikolas Cruz posted pictures of guns and knives on Instagram. Police are actively investigating his “disturbing” internet history. Nikolas Cruz, the teenager suspected of killing 17 people in a high school shooting in Florida, flaunted his obsession with guns on Instagram. Various media outlets have taken screenshots of his account, which appeared to display his preoccupation with guns and knives. The account, Instagram/cruz.nikolaus, was taken down following Wednesday’s atrocity at Majory Stoneman Douglas High in Parkland. One photo, which is being widely circulated on social media, shows Cruz posing for a selfie with what appears to be a toy gun on December 25, 2015. US law dictates that all fake guns should have an orange tip, like the one in the image apparently posted by Cruz. Other posts show the 19-year-old, who was expelled from Stoneman Douglas High, posing with bullets and knives, often concealing his face with a bandana. One image appears to show Cruz looking down the sight of a gun, which is aimed out of a window.